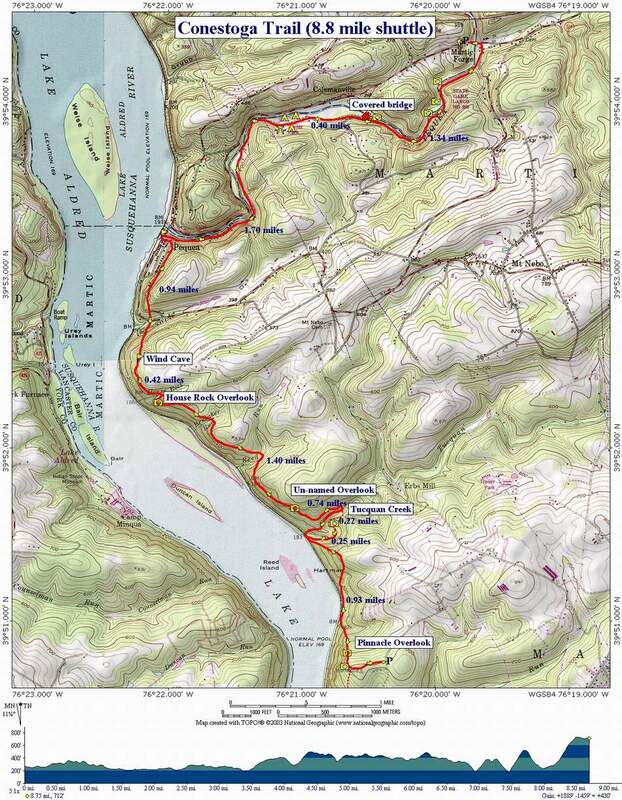 Description: This is an 8.8 mile strenuous shuttle hike in the Holtwood Recreation Area along Lake Aldred in southeast PA. It features an easy walk along scenic Pequea Creek, the town of Pequea itself, a visit to a nineteenth century covered bridge, a tectonic cave, the beautiful Tucquan Creek Nature Conservancy and 5 overlooks. The strenuous rating is a result of 5 sets of steep ascents and descents throughout the hike. They are all relatively short but the emphasis is on the word steep. 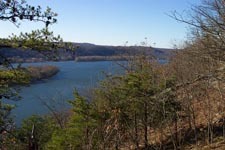 The final climb up to the Pinnacle Overlook has an elevation gain of 550 feet in about ¼ mile. From here hike back down to the ruins of the Old Martic Forge Hotel on River Road to start the hike. Trail Notes: The Conestoga Trail is blazed orange. A slanted double blaze denotes a change in direction. In rocky areas, the rocks themselves may be blazed. Re-cross the bridge and turn right onto River Rd. Telephone poles carry the blazes. Near the end of a split rail fence will be double blazes directing you down to a wide trail. This used to be part of a trolley line that ran from Lancaster to Pequea. Turn left onto the trail and follow scenic Pequea Creek. 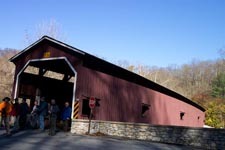 At 1.34 arrive at a paved road and a covered bridge to the right. Continue straight on the road following the orange blazes. At 0.4 miles from the covered bridge, walk through Pequea Campground. Ice Cream can be purchased at the camp store in season. The trail continues on the other side of the campground. You will walk along a gravel road with summer homes (many of them derelict and ready to come down) high up on the hill to the left. At 1.7 miles from the campground pass Pequea Boat Club on the right. The blazes and this map direct you to turn left onto Ridge Road. I prefer to stay on the lower road and follow the lake. Pass the volunteer fire dept. on the right. The road will bear left, uphill and away from the lake. Watch for orange blazes on the right. Descend through the woods passing a spring house and crossing a woods road. The trail continues on the opposite side of the woods road. 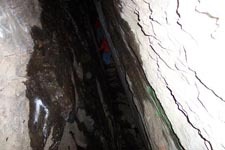 Climb steeply up a footpath to the Wind Cave (0.94 miles from the Ridge Rd intersection). From the wind cave proceed to climb, sometimes through the rocks to the top of the ridge. In 0.42 miles you will descend through an area called Fat Pack Squeeze, cross House Rock Run and climb to House Rock Overlook. 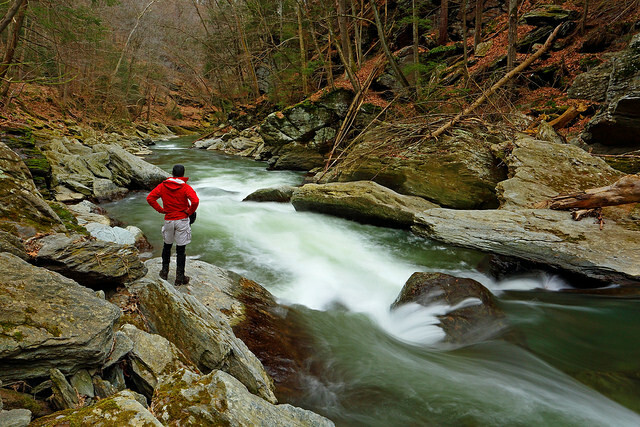 Over the next 1.4 miles you will descend and climb through two small coves, crossing small streams as you go, and visit another overlook before descending towards Tucquan Creek. If you are prepared for a stream crossing you can cross an unmarked trail and follow the orange blazes across and down Tucquan Creek to the railroad tracks. Since I usually lead this hike in the cold months I turn right on the unmarked trail. At it’s crest it becomes a woods road. Follow this down towards the tracks. Towards the bottom turn left onto a footpath and follow it down to the tracks. Turn left and cross a culvert over Tucquan Creek. On the other side of the culvert the trail resumes. 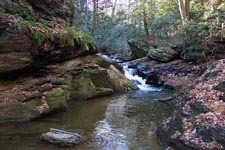 To visit Tucquan Creek follow the trail through the rocks and Rhododendrons. A 0.25 miles round trip of the creek is include in the mileage as described. In this case the turn around point is a wooden bridge that traverses a blowout of the trail. To complete the hike return to the tracks and turn left. Climb back up to the ridge. Shortly after reaching the top you will turn left onto a woods road. In a short distance you will turn right onto another footpath and slowly descend to the base of the Pinnacle ( about 0.7 miles from Tucquan Creek). Begin a steep climb up to a prominent rock out crop on the right and at 0.25 miles from the start of the climb arrive at the Pinnacle Overlook parking area. I hiked the Conestoga Trail as described above, except that I returned back to the Martic Forge trailhead, forgoing the shuttle. The trail was well blazed and easy to follow. The stats I measured for the round trip hike were: 17.25mi and a 3550ft elevation gain (including an extra 40-50ft climbing in and out of the Pequea Creek gorge while taking photos). It took me 5.3hrs to hike in, mainly because I wasted a bunch of time in taking photos, but only 3hrs for the return (despite the 1500ft+ elevation gain). I'd like to make one correction to the original hike description: "Ridge Road" is actually "Bridge Road". 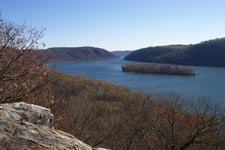 Critique: We parked our car near Pinnacle Overlook and went all the way to Martie Forge and then all the way back to Pinnacle Overlook. The trail is strenuous only upto Pequea. After that the way to Martie Forge did not even feel like hiking. We were simply walking on roads for a very long time. While returning back, the last segment climbing upto Pinnacle Overlook is soul destroying. You just keep climbing up seeing that every blaze is higher than the previous one. Since this was at the end of the day, I guess I was physically battered as well making the task all the more challenging. As soon as I crossed the finish line and entered the grassy picnic spot of Pinnacle Overlook my legs gave way and I fell down with horrible cramps. Luckily that did not happen on the trail. Sat on the grass enjoying the view in pain for about 10 mins then went to the car and left. As this is my first hiking experience I would say keeping my water salt balance was the biggest lesson. I got 2 litres water with me which was not enough by any means but luckily the other person hiking with me had a UV water filter so we were able to get ample water from the streams and drink. The real problem was that I did not eat enough. In all the sweat and grime I was in, I did not feel like eating, even though I had enough food, which was a mistake. The blazes are quite well maintained and easy to follow. Overall it was a great first hike experience. Critique: Lovely hike and deserving of the strenuous rating. We didn't want to take two cars for the shuttle hike so we decided on starting at the Pinnacle Rock Overlook parking lot and doing an out and back to the Wind Cave. We overshot the Wind Cave a bit on the way north (easy to hike right by northbound, hard to miss southbound) and went past it to the woods road before turning around. Total mileage was 9.1 with a total elevation change of 2500 feet each way according to our GPS tracker program for a total hike elevation change of 5000 feet. It's a death by a thousand small, steep hills kind of trail so be prepared to be tired. I realize that was doubly so for us because we chose the hilliest part for the out and back but I'd still highly recommend this hike. Really nice scenery and cool with lots of shade, breezes and waterways along the route. The Tuquan Creek stretch is particularly lovely and a great break from the harder bits to either side of it. We did the stream crossing and found a place about 10-15 feet past the actual marked crossing where we could rock hop without really getting our feet wet. The blazes are much improved from the previous years' comments. In fact this trail is now very well blazed. We had no trouble following the orange blazes - the turns were well marked as were the bits going over and through rock formations, and the orange Conestoga trail was easy to distinguish when it ran alongside other trails and then split off from them. At some points you may need to pause and look for the markings (ie- around the rock formations) but they are there and easy to make out. Note that 3 other trails run alongside on the Tuquan Creek stretch (blue-blazed Tuquan Glen on the south bank and white and yellow trails on the north side) so just watch for blazes marking the split offs for the Conestoga trail- they are slanted double slashed and well-marked. Critique: We sort of pieced 2 hikes together to make a long day hike with some decent elevation gain. We started at Holtwood Recreation Area and hiked down Kelly's Run, then proceeded on to the Pinnacle then up the Conestoga Trail past the Wind Cave to the covered bridge about 1.3 miles before Martic Forge, then turned around and hiked back to the car. On the way back, we skipped the Tacquan Creek detour, and also took the meadow walk Kelly's Run return trail instead of back along the run itself (our feet were tired). We had wanted to go all the way to Martic Forge, but it was getting late, and we had a LONG way back to the car. By GPS, total hike was 21.1 miles, with 6,062 of elevation gain. A pretty good jaunt. First of all, the little green pamphlet from PPL containing the map to the Kelly's Run area really STINKS. Just about worthless. Second, the Tacquan Creek portion of the trip is a bit confusing, as there are blue blazes on both sides of the creek so we were left wondering which ones we should follow. Eventually, I figured out that they both led the same place, but it slowed us down considerably. The Conestoga Trail for the most part is blazed pretty well; however, there was one part near the Tacquan Creek area where a blaze indicating a change of direction was nearly impossible to see because the tree it was on was leaning in the direction you were coming from. We missed it, and ended up taking a .25 mile detour before we turned around. Then we wandered back and forth trying to find the orange blazes again, before my hiking partner finally noticed the blaze on the leaning tree. Kind of a pain. We weren't the only ones complaining about the blazing either -- we met 4 others groups (including a nice couple who did an AT thru hike last year) who were having issues following the balzes. 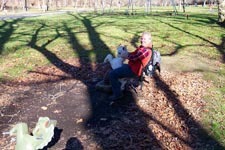 All in all, a decent day, but some of the trail marking is a bit suspect. Coupled with the fact that there aren't any good maps of the area makes this one a bit of a challenge. However, the hike we did does have some good elevation change, so if you're looking for a good strenuous hike close to Philly, this one is pretty good. Nothing else I have done within a 2 hour ride of Philly comes close. Critique: If you notice something on the trail that needs attention, blow downs, etc, you can contact me directly and we will get to it as soon as possible. Ken Fillo (kenfil@ptd.net) trail care coordinator for the Lancaster Hiking club, maintainers for the Conestoga Trail System. Try the Northern end, not as strenuous, but you can connect with the Horse-shoe trail for steeper climbs if you like. 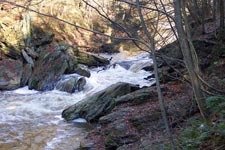 The northern end follows along the Hammer creek, and speedwell forge lake, along the edges of pastoral farm land. I did the Conestoga Trail shuttle recently and truly enjoyed the hike. Due to transportation limitations, I hiked this trail in the opposite direction of the guide above. I parked at the north end and got dropped off at Holtwood Park, starting at the trailhead for Kelly's Run. 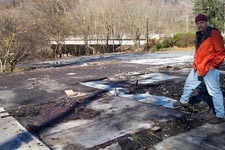 As for the north end, the old Martic Forge Hotel is no longer there, and parking was simple alongside the foundation. By starting at Kelly's Run, I added a few extra miles, albeit scenic ones, to my trip. The rock outcrop just a few hundred yards north of the official overlook parking provides beautiful scenery and a great place to stop for photos. The descent from the Pinnacle has some large trees down, and it's relatively steep, but it's clearly marked and has stable footing. The trail emptied out at the railroad tracks, cut right, and followed along Tucquan Glen for a short distance beyond the above mentioned wooden bridge. The water at the crossing was higher than my boots, but about 20 yards downstream was large tree that made for an easy, and dry, crossing. The climb up the other side was straight up, with several very large downed trees. Eventually you get to an un-named overlook, which was actually my favorite of the hike. 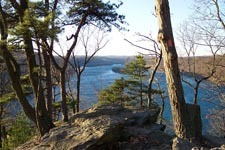 There are several rock formations to climb up, and around, at various locations on this hike. House Rock overlook was trashed. I was carrying a full/heavy pack as an extra challenge, and had no room for all the trash there. Next time I'll bring a rubber glove and trash bag. Once I descended from Wind Cave, I got to service road and the orange blazes ended. Downhill was the railroad that would have taken me into Pequea and to the marina and around, but to save time off my trip I turned uphill for about 1/2 mile and cut through to the campground under the power lines. I picked up the markers again in the campground, and the walk back to car was a flat, easy straight walk, and a nice chance to reflect on a great day hiking. Generally speaking, I concur with the strenuous rating, mostly due to the hills. This was my first time on this trail, and I was carrying a pack for the additional challenge. With all the hills, I was definitely presented with a challenge. Some of the trail is right alongside private property. The owner has clearly, and frequently, posted signs to keep out, so please honor that. The trail was generally easy to follow in amongst the trees, but many of the trees with markers were down along the side of the trail. Up in the rocky regions it wasn't quite so simple. Some markers were sparse, or too low and you couldn't see them when looking uphill. Overall, I'd say this trail is a hidden gem, even if it's "in the rough." Plenty of elevation changes, several scenic overlooks, creek crossings, and a variety of ground conditions. This is a great hike to try and develop a variety of techniques. All in all, I like the more rugged portion of the hike. Next time, I'll probably go just from Kelly's Run to the marina in Pequea. Critique: Even though trail conditions were poor with a lot of downed trees lying across the trail, the views overlooking the river were great. In comparison to the AT, this trail needs work ! I'm assuming that since we did not see a lot of trash along the trail that it gets little use.